One San Francisco-area family thought they were getting a special behind-the-scenes tour of Levi’s Stadium this week, meeting players and seeing the facilities. 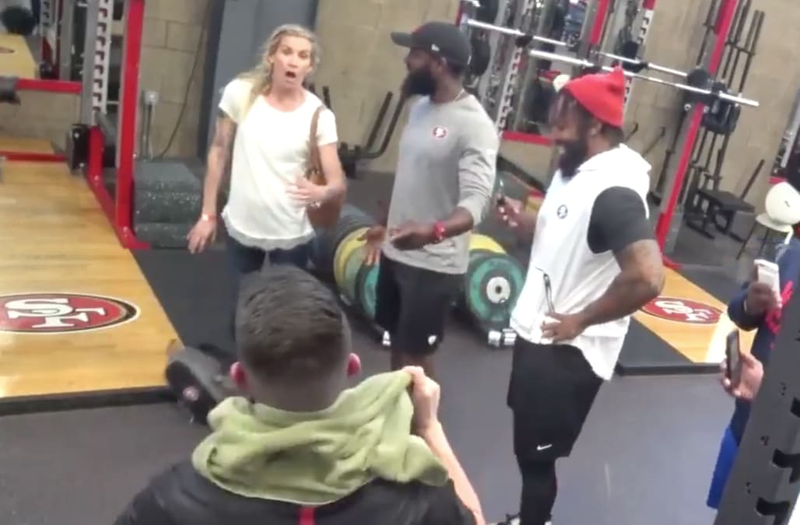 But as Air Force Technical Sergeant Rob Thomas’ wife and two children were on the Levi’s field, playing catch and posing for photos, Thomas was getting picked up at the airport by 49ers’ linebacker Dekoda Watson. Thomas had been deployed for six months, and was finally back home – but his family didn’t know he was back. Once Watson and Thomas arrive at Levi’s, the players put Thomas on a weight bench and bring his family into the room. Thomas is lifting, getting encouragement from the players, then sits up and removes the towel from his head. The stunned look on his wife’s face says it all. The players cheer as the couple embraces. Fighting not to cry, Thomas said he wanted the special reunion to give recognition to his wife for the sacrifices she’s made. “We don’t have family around, so she had to do it all by herself – the kids, baseball practice, gymnastics, plus she’s a full-time student, about to graduate… She’s my rock,” Thomas said. Is it dusty where you are too? American baseball player Ted Williams (1918 - 2002) of the Boston Red Sox serves in the United States Marine Corps during the Korean War, circa 1952. Red Sox outfielder Capt. Ted Williams (left) and Cleveland Indians outfielder Capt. Bob Kennedy, two former opponents in the baseball world, smile together as they team up in the same Marine Corps flying squadron. The two had just returned (above) from Maneuvers in Puerto Rico, where they flew their F-9F Panther Jets in close ground support exercises. New York Yankees great Joe DiMaggio enlisted in the Army Air Forces in 1943. Navy quarterback Roger Staubach served four years in the Navy Supply Corps, including in Vietnam, before leading the Dallas Cowboys to two Super Bowl wins in the 1970s. New England Patriots long snapper Joe Cardona (49) is an officer in the U.S. Navy and, as of 2017, is the only active NFL player who is also in the Armed Forces. Mike Anderson, who was named Offensive Rookie of the Year in 2000 with the Denver Broncos, spent four years in the Marine Corps after high school. Running back Rocky Bleier was drafted and served in Vietnam in 1969. He received the Purple Heart and Bronze Star for his service before returning to play for the Pittsburgh Steelers. Bob Feller (C), Cleveland Indians' star pitcher, is sworn into the Navy by Lieutenant Commander Gene Tunney (R), as Chicago recruiting officer Lieutenant David N. Goldenson looks on. Feller got a rating of Chief Boatswain Mate and will assist in the Navy's athletic program. Yogi Berra served in the U.S. Navy during World War II before joining the New York Yankees. Roberto Clemente was a member of the Marine Corps Reserve. Five years prior to joining Major League Baseball, Jackie Robinson was drafted into the Army. Whitey Ford, who helped the Yankees win the pennant and World Series in 1950, holds the ball he threw out to start the new season at Yankee Stadium. With Whitey, now a soldier and a brand-new bridegroom, is Mrs. Ford. Vic Raschi, another fair chucker, blanked the Red Sox, 5-0. Heavyweight champion Joe Louis, known in Army circles as private Joseph Louis Barrow, is pictured here as he prepared to start training workouts at Fort Dix, N.J. Joe meets big Abe Simon at Madison Square Garden March 27th in defense of his title for benefit of the Army emergency fund. San Francisco Giants player Willie Mays being sworn in for the military. Ahmard Hall #45 of the Tennessee Titans, a Marine Corps veteran, runs onto the field carrying an American flag before the NFL game against the Baltimore Ravens on November 12, 2006 at LP Field in Nashville, Tennessee. Two-time NBA champion David Robinson attended the Naval Academy and was commissioned in the Naval Reserves for two years. Nolan Ryan put service in with the Army Reserve in 1967. 1917 photo shows Ty Cobb as a Captain in the U.S. Army. Between high school and college, Tom Seaver enlisted in the Marine Corps Reserves. Larry Doby saw combat while in the Navy prior to joining the Cleveland Indians. Christy Mathewson, Hall of Fame pitcher for the New York Giants, enlisted in the Army Chemical Corps. Knicks star Bill Bradley served in the Air Force Reserves prior to joining the team. Four-time NBA champion Bill Sharman served in the Navy during World War II. Buffalo Bills tackle Bob Kalsu enlisted in the Army after his rookie year and was killed in action on July 21, 1970. Former NFL star and U.S. Soldier Pat Tillman is pictured in this June 2003 file photograph.